“Change or Die”. The title of Alan Deutschman’s book says it all. While mandates for organizational change may not always be quite so severe, the fact of the matter is that any organization that isn’t undergoing change, or at a minimum contemplating a change, may reach a point of diminishing value. Nowhere is this axiom more applicable than in the finance function. The dynamic nature of finance demands constant attention to improvement opportunities, some of which may be dramatic (e.g., out-sourcing or reorganization) and some of which may be less so (process redesign). 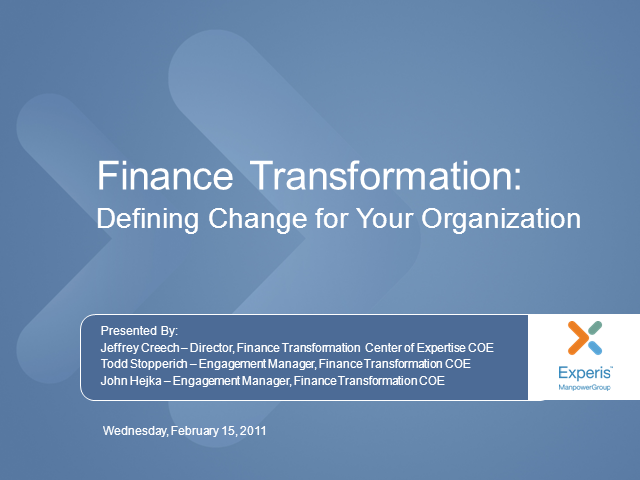 Regardless of the scope of change, the results are likely to be significant to the organization.